KATHMANDU: The government has pledged to set up one-stop service units for investors at the earliest aiming to provide easy and fast services. The units to be set up at the Investment Board Nepal and the Department of Industry aim to eliminate bureaucratic hassles and delays. Such units will provide services ranging from company registration to investment approvals. Government officials said that arrangements to set up one-stop service units are almost complete. One-stop service units at the Investment Board will deal with projects worth Rs 6 billion and above and in case of hydropower projects, those of 200 MW and above. Projects below Rs 6 billion investment and hydropower projects below 200 MW capacity will be dealt with by 11 one-stop service units at the DoI itself, said Industry Secretary Yam Kumari Khatiwada during a press meet at the Ministry of Finance on Wednesday. Procedures for setting up and operation of the services also known as one-door services have already been endorsed while 90 percent preparations have been completed, Khatiwada claimed. The recent laws have made it mandatory for government agencies to issue investment approvals to eligible investors within seven days. Likewise, Maha Prasad Adhikari, IBN CEO, also committed to set up one-stop service units at IBN and said the layout and design work for the same are ready. Setting up such units have been possible after the parliament endorsed Public Private Partnership and Investment Act 2019 last week. However, both Khatiwada and Adhikari declined to give specific date for starting the units, which have remained a longstanding demand of both domestic and foreign investors. These preparations are being made in the wake of the Investment Summit 2019 slated for Friday and Saturday. Before this, such a summit was organized in 2017. Speaking at the press meet, Minister for Finance Yuba Raj Khatiwada said that the government has made all preparations to welcome foreign investors in the event. The government will showcase 77 projects including 27 projects from the private sector, at the summit. Minister Khatiwada also said that they have plans to sign as many as 12 Memorandums of Understanding with investors at the summit. “The summit also provides a networking platform for domestic and foreign investors, national and international banks and consultants and experts,” said Khatiwada. Sideline meetings and B2B (business to business) meetings have also been planned among investors. Over 600 foreign investors from 40 countries, 350 Nepalis and 50 Non-Resident Nepalis will participate in the event. 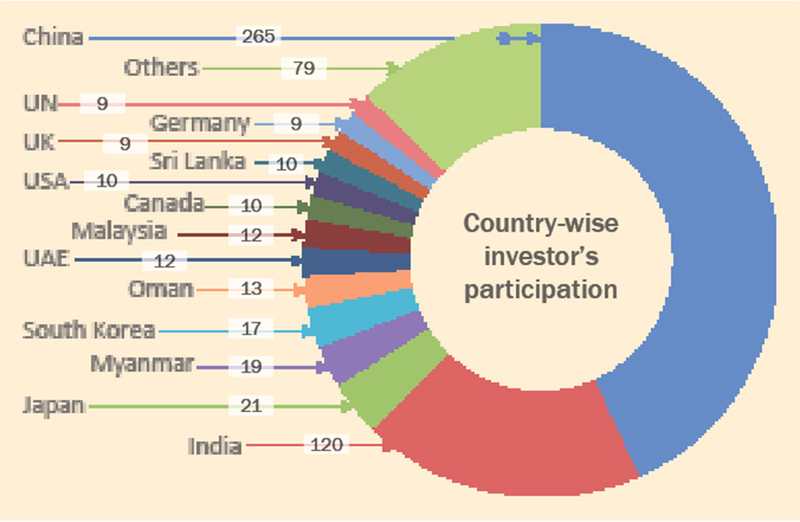 Among them, 265 investors from China and 265 from India will be participating in the summit. The number of participants from Japan, Myanmar, and South Korea will be 21, 19 and 17 respectively. Prime Minister KP Oli will inaugurate the summit.